OTTAWA — Federal ministers are playing down the potential for racial profiling and civil-rights violations as they tout strict new measures against drunk driving. Mandatory alcohol screening regulations taking effect Dec. 18 will allow police to demand a breath sample from any driver they lawfully stop — a lower bar than the current threshold, which requires suspicion the person has been drinking. The roadside test could justify further investigation including more elaborate testing at a police station. The government says the aim is to save lives by helping police catch drivers with more than the legal limit of alcohol in their bloodstreams. 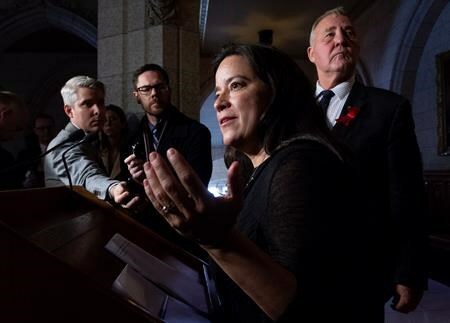 Justice Minister Jody Wilson-Raybould says she’s confident the measure is consistent with the Charter of Rights and Freedoms. Organized Crime Reduction Minister Bill Blair says if a police stop were motivated by bias, it would be unlawful and contrary to the charter — and therefore a breath test would be inadmissible in court. As co-owner of Ryde RD Spin Cycling, Alex Wood may have had a slight athletic advantage over even the most physically fit celebrities in the 2019 Celebrity Dance Off. Wood also trained as a dancer when she was growing up. Did all that pay off? Well some of the judges and many of the spectators were under the impression their might be two pros on the floor when Wood and pro partner Peter Samoila performed. Check out this fast and flawless salsa / cha cha mix. Amazing doesn’t do it justice! I grew up here in Red Deer, this is home. It took me a while to return after high school but I am so happy to be back. I co-own Ryde RD Spin Studio. Red Deer was the perfect place for my husband Dave and I to start our business. I studied at Montana Tech and graduated as a petroleum engineer. I met my husband there and we made our way to Calgary for work. After two and half years, I decided that a desk job wasn’t for me so we packed our bags, moved to Asia and travelled overseas. After too much fun in the sun, we decided to move to Red Deer to start Ryde. Supporting our clients and the community is very important to us. We’ve hosted many charity Ryde’s including one for the Sheraton Celebrity Dance Off. Over the next few months, I’ll be putting my travel bug on hold, trading my spin shoes in for dancing shoes, and trying to regain my dancing skills from my teenage years. I’m honored to be a part of this event and passionate about the cause.